Many philosophers consider character to be both morally and existentially important. Perhaps the most prominent example of this attitude can be found amongst virtue ethicists. According to them, the morally good life is the one that consists in the cultivation of valuable character traits such as honesty, courage, justice, and so on. If something were to disrupt or distort virtuous character it would be, from this perspective, a “bad thing”. Given the prominence of this attitude, it should come as no surprise to learn that many a critic of human enhancement has launched a character-based attack on the idea. Chapter 5 of Allen Buchanan’s book Beyond Humanity takes these critics to task and dismisses most of them with considerable vituperativeness. Over the next few posts, I want to see what Buchanan has to say. I begin in this post by looking briefly at some concepts that will help to frame the debate. I then move on to consider Michael Sandel’ s giftedness argument against enhancement. Bear in mind at the outset that a distinction is typically made in the enhancement debate between therapy or treatment and enhancement . This will crop up from time-to-time over the course of this series. How viable the distinction actually is, is a matter of some dispute: critics of enhancement usually think it is genuine; proponents of enhancement usually think it is not. Buchanan starts his chapter by identifying two types of character-based critique of enhancement. They are the expressivist critique and the consequentialist critique. The former maintains that the desire for enhancement is, in and of itself, expressive of a morally corrupt character; the latter maintains that the desire for enhancement has as its consequence the corruption of moral character. Expressivist critiques tend to be more common among the critics of enhancement. (A) Expressivist concerns are conclusive objections to the pursuit of all forms of biomedical enhancement. (B) Expressivist concerns are conclusive objections to the pursuit of some forms of biomedical enhancement. (C) Expressivist concerns are conclusive objections to the society-wide endorsement of the enhancement enterprise, i.e. liberal democratic states should not lend their imprimatur to enhancement even if it is not completely outlawed or banished. (D) Expressivist concerns are merely considerations to be taken into account when deciding which enhancements should be pursued - they should be weighed against competing considerations. Buchanan thinks that (D) is, by far, the most plausible line that a critic could take. Indeed, it is one that not even the most ardent proponent of enhancement is likely to dispute since they are rarely, if ever, unqualified supporters of all forms of enhancement. Nevertheless, some critics try to push the stronger argument. We’ve actually already come across an example of this on this blog. Nicholas Agar tries to use the precautionary principle to defend an argument against radical enhancement. This argument - the species relativist argument - is partly motivated by character concerns and would seem to be an instance of (B) above. 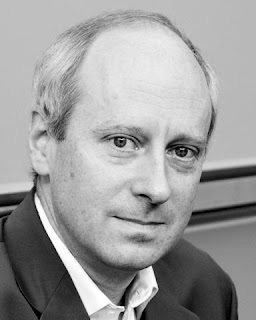 Another example of an alleged conclusive objection can be found in the work of Michael Sandel. He provides something called the giftedness argument against (all) forms of enhancement. At the start of chapter 5, Buchanan tries to reconstruct and critique this argument. The remainder of this post is dedicated to reporting on his efforts. Sandel maintains that the use of biomedical enhancement is expressive of a desire for “mastery”. Thus, a person who seeks to biomedically enhance themselves is seeking to control all aspects of their lives, to overcome all contingencies, to leave nothing to chance. This, Sandel proposes, is incompatibile with the sense of “giftedness”. This is the sense that many aspects of one’s life, including those aspects that are most valuable, are the product of events and circumstances outside of your control. Sandel thinks the sense of giftedness is of great value, and that anything which undermines it should be stopped. (1) The sense of giftedness is a central human good (or an important part of good character). 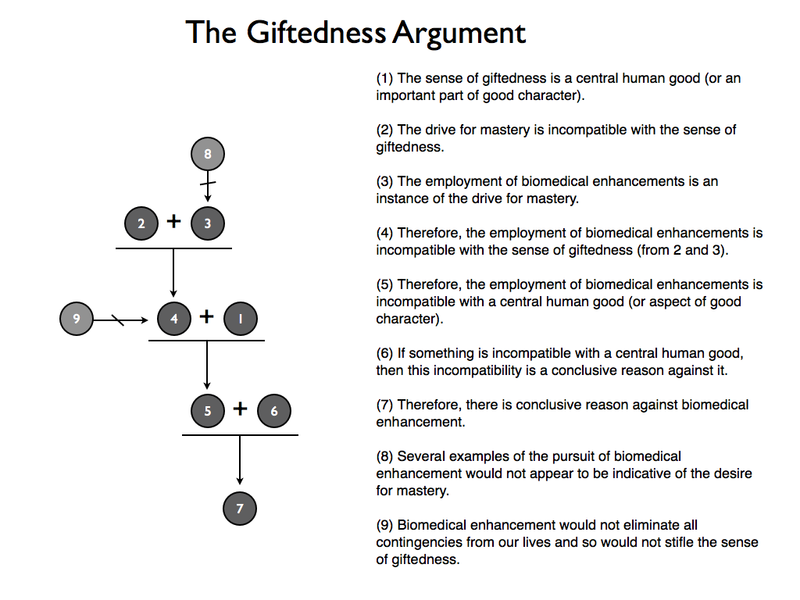 (2) The drive for mastery is incompatible with the sense of giftedness. (3) The employment of biomedical enhancements is an instance of the drive for mastery. 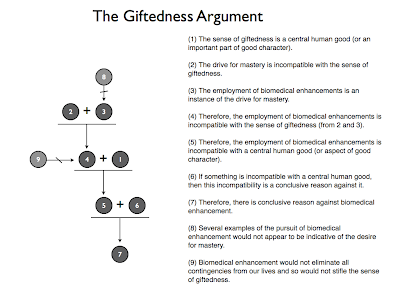 (4) Therefore, the employment of biomedical enhancements is incompatible with the sense of giftedness (from 2 and 3). (5) Therefore, the employment of biomedical enhancements is incompatible with a central human good (or aspect of good character). (6) If something is incompatible with a central human good, then this incompatibility is a conclusive reason against it. (7) Therefore, there is conclusive reason against biomedical enhancement. Buchanan notes that (6) is far from obvious here. Likewise, from my perspective, it’s not clear that mastery is necessarily bad and that giftedness is necessarily good. Still, we can grant those premises because the argument appears to fail for another reason. Why is Buchanan so confident in this pronouncement? Well, it’s because he thinks there are several clear counterexamples to it. He cites two. The first involves someone who is having their eyes surgically corrected and decides in the process to seek better than 20/20 vision because it would help improve his birdwatching. Is this person pursuing mastery? Surely not; surely they just want a bit of a leg-up in their hobby? The same seems to be true for those pursuing enhancements such as increased numeracy and proficiency in order to increase their productivity at work. They want a leg-up at work, not control over all contingencies. This brings in another important consideration: the motives underlying the pursuit of biomedical enhancements would be shared by other non-biomedical forms of enhancement (e.g. putting your children in better schools, giving them music lessons, improving their diet etc.). Are we then to assume that pursuing these more traditional forms of enhancement is indicative of a desire for mastery? That would seem to be the logical implication, but there’s very little criticism of the more traditional forms. There’s another problem with the whole argument. It’s that it grants far too much power to biomedical enhancement and has far too little respect for the true extent of “giftedness”. Buchanan argues that even if we lived lives of up to 400 years and were cognitively and emotionally enhanced, we would not thereby gain control over all the contingencies affecting our lives. We would still be vulnerable to natural and man-made disasters, still at risk from the actions of others, still beholden to a thousand and one random everyday occurrences. So even with enhancement, there would be space for the sense of giftedness to thrive. (8) Several examples of the pursuit of biomedical enhancement would not appear to be indicative of the desire for mastery. (9) Biomedical enhancement would not eliminate all contingencies from our lives and so would not stifle the sense of giftedness. (8) clearly targets premise (3). I’m a little less certain about (9), but I’ve decided that it really functions as a counterargument to the conclusion reached by the first part of Sandel’s argument. I’ve illustrated this in the diagram below. Perhaps all is not lost; perhaps Sandel’s argument can be salvaged if it is reinterpreted in less decisive terms. Buchanan is willing to play this reinterpretive game but observes that it will require us to dismiss what Sandel actually says. (Note: I haven’t read Sandel, so I’m forced to assume that Buchanan’s characterisation here is fair). There are four alternative interpretations worth considering. First, it may be that Sandel does not mean to imply that enhancement will leave nothing left that is outside of our control. It may be that he means to imply that our sense of giftedness is simply diminished. Buchanan responds to this by saying that since the domain of the contingent is so vast, it’s hard to know in advance whether biomedical enhancements would make a significant dent on it. Particularly not one that warrants giving up on its potential benefits. Buchanan can’t imagine what Sandel would plausibly say to defend even this weaker diminishment argument. Second, perhaps this argument has nothing to do with facts and everything to do with beliefs. In other words, maybe what matters is that people begin to believe that they have mastery over the contingencies of life, not that this is actually the case. Buchanan responds that this would be a very strong prediction to make. Effectively, it proposes that the pursuit of enhancement will lead to a mass collective delusion. Sandel needs to provide evidence that such a thing is likely. Third, maybe all Sandel is saying is that enhancement will provide an outlet for some unsavoury tendencies that some people tend to have, such as their overestimation of their ability to control things. Buchanan responds that this has been a standard critique of all forms of technology and is not unique to biomedical enhancement. Thus, it cannot be part of a conclusive case against enhancement. It can only count as another consideration to bear in mind when pursuing the enhancement enterprise. Fourth, perhaps Sandel is saying that the pursuit of enhancement without limit is the problem, not the pursuit of any kind of enhancement. In that case, Buchanan responds, the argument amounts to little more than a platitudinous warning. No serious proponent of advocates the unrestrained, unregulated pursuit of enhancement technologies. They all urge a serious consideration of the risks and rewards involved. In the end, even if some of these reinterpretations are successful, they do not support the strong conclusion that Sandel would like to reach. We would be wise to take into consideration Sandel’s warning, but we would be silly to treat it as determinative of anything in isolation from other considerations.